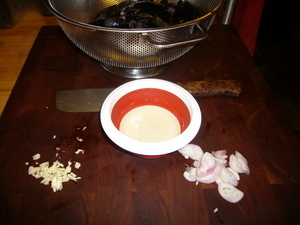 While a large pan preheats, mince the garlic, slice half the shallots and clean the mussels. Add half the oil to the preheated pan, followed by the minced garlic and sliced shallots. Saute for about 2 minutes. Toss in the mussels, and stir for a minute or so over medium high heat. Add the vermouth and cover. Cook, shaking the pan from time to time for a few minutes or till mussels open. 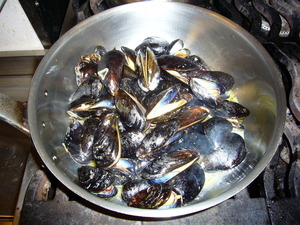 Remove the mussels from the heat as they open, reserving all liquid. As mussels cool, remove them from their shells, again reserving the liquid. Strain all the liquid through a fine sieve. You want about two cups. If you're short, supplement with stock. 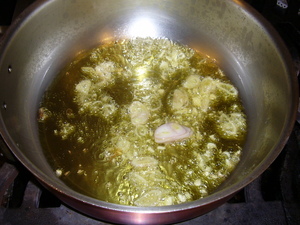 Add the remaining oil to the TM and process at speed 5. 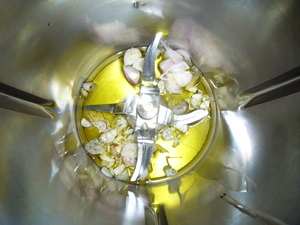 Quarter the remaining shallot and drop the shallot and garlic onto the turning blades and turn TM off. Set heat to 100C and process at speed 1 for 3 minutes. Install the butterfly. 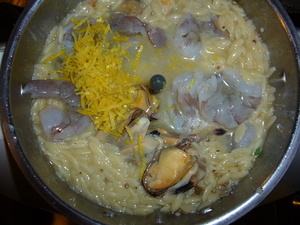 Add the orzo and the reserved mussel broth. 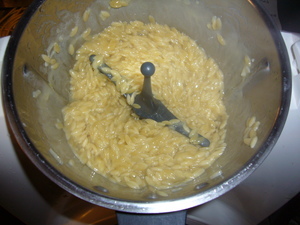 Process at 100C speed 2 for about 8 minutes or till most of the liquid is absorbed (see picture). While orzo cooks, zest the lemon and coarsely chop the zest. Juice half the lemon (we need about 1 tablespoon. If your olives have pits, cut the meat off. Coarsely chop the olives. Mince the parsley. Add the stock to the orzo. Adjust salt and pepper. Process at 100C for 10 minutes at speed 1. 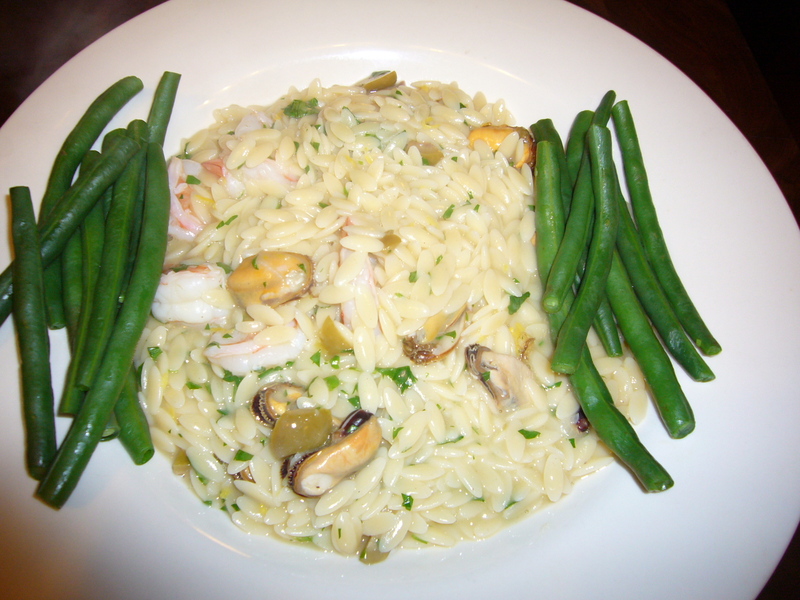 Shorten or lengthen the time to allow for orzo to be just undercooked. 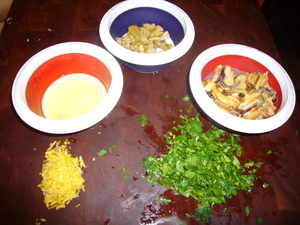 Add the lemon juice, lemon zest, mussels and shrimp. Process at 100C for 2 minutes, speed 1. 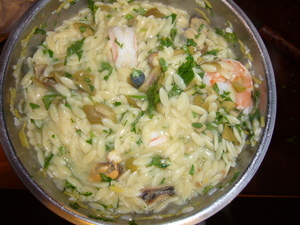 Stir in the parsley and olives. Plate and enjoy.